A hole in your laminate countertop doesn't mean you have to replace all of your counters. You can instead repair the damaged section with tile. Adding a tile insert is an affordable way to make the repair. As of 2010, you can expect to pay about $30 if you repair it yourself using tile. At the end of your project, your counter will have a beautiful, decorative tile insert, and visitors will never know that there used to be a hole there. Repair a kitchen countertop hole with a tile insert. Choose the tile to repair kitchen countertops. Finding a tile that complements the current colors and style of your kitchen will help it look like the tile countertop insert was part of the original design of the kitchen. Determine the pattern you want. Create a design in the shape of a rectangle or a square so you don't have to cut any tiles to make them fit. Lay your tiles out in different designs and patterns until you find the look you prefer. Cut out the damaged section of laminate kitchen countertop using a router. Set the depth of your router so it's 1/16-inch greater than the width of your tile. Cut out the section where you will create your tile countertop insert. If the hole in your countertop is deep and penetrates even farther than the depth you cut with your router, it's okay. Thinset will help fill in the hole, so there's no need to make a deeper cut with your router. Paint on a coat of polyurethane to the exposed particleboard. Laminate countertops have only a thin layer of laminate on the top; the rest consists of a brown particleboard you would otherwise never see. Wait 24 hours after you apply the polyurethane to make sure it dries completely before you continue with your project. Dip a putty knife in a bucket of thinset. Spread it on the bottom of your countertop insert. This is what helps the tile adhere to the particleboard. 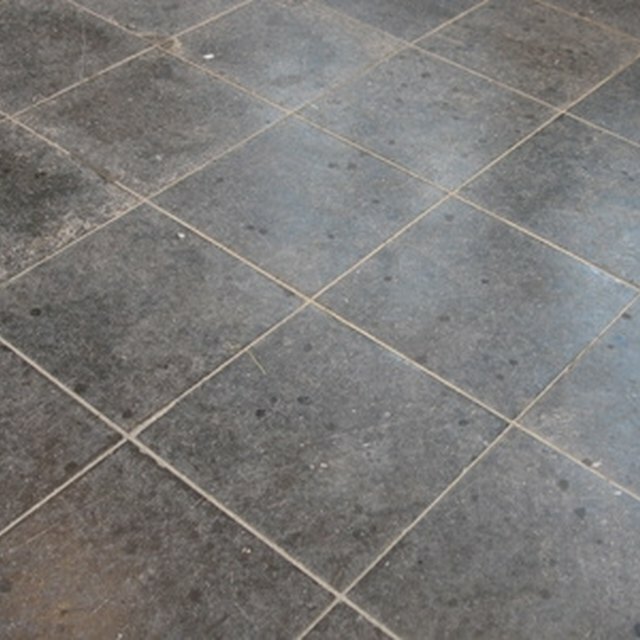 Read the directions on your sanded grout and mix the grout mixture with water. Use a sponge to smooth your sanded grout across the surface of your tile. Make sure the grout gets in between all of the tiles. Wipe down the tile with a wet rag to remove any grout on the surface of the tiles. Let the tiles set for another 24 hours; then you can use your tile countertop insert as normal.